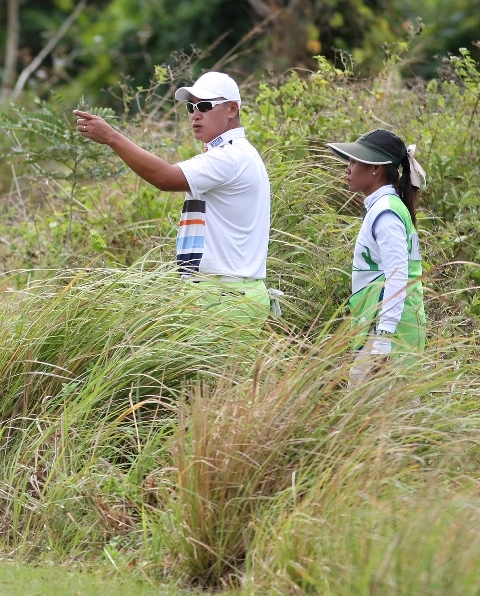 An errant tee shot sends Angelo Que to the thick Anvaya grasses. 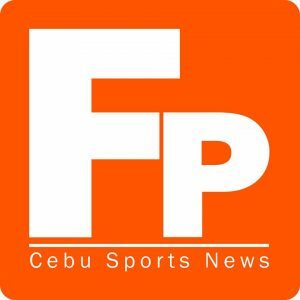 MORONG, Bataan – Angelo Que turned the course upside down in the absence of the wind – and despite another late-hole mishap – shooting two eagles on his way to a six-under 66 and a whopping seven-stroke lead over Toru Nakajima in the third round of the ICTSI Anvaya Cove Invitational here Friday. Like in the first two rounds where he lost steam after fiery starts, the 34-year-old Que holed out with a bogey on No. 18 that, however, hardly mattered to his blistering surge on a course that he tamed with power hits, superb iron game and solid putting, posting a lead so huge that it could be virtually over even before he hacks his first shot in Saturday’s final round. “All I need is watch out for Nakajima. Even if the rest would score low, I wouldn’t mind since they’re too far behind to contend,” said the 34-year-old Que, who assembled an 11-under 205 total to move 18 holes away from nailing his second Anvaya crown worth P650,000 in only the third staging of the P3.5 million event sponsored by ICTSI. “Overcoming a seven-stroke deficit is a difficult task,” said Nakajima, who failed to match Que’s scorching birdie-eagle surge in the early going and conceded the crown to the power-hitting Filipino with a 212 aggregate in the kickoff leg of this year’s Philippine Golf Tour. Que, who grabbed a one-stroke lead over the Japanese halfway through the event organized by Pilipinas Golf Tournaments, Inc. Thursday, actually dropped to joint lead with Nakajima with a bogey on the first hole. But the former Philippine Open winner went five-under in the next four holes, spiked by a 40-foot eagle putt on the drivable par-4 332-yard No. 3. He made the turn at 32, eagled the par-5 No. 10 from 20 feet after a 7-iron second shot from 160 yards, then birdied the next before settling for a run of pars and holing out with a missed green bogey. But shooting two eagles in one round isn’t new to Que, who beat Tony Lascuña by three here in 2015 on a nine-under total, saying he has made the feat more than 10 times in his 14-year career, that included three Asian Tour titles. Nakajima, who impressed the elite field with a flawless 68 in the first round and stayed in the hunt with a 70 Thursday, blew a two-under card with two bogeys in the last seven holes, ending up with a 72 and stayed at second – but seven shots behind at 212. Despite playing on practically a windless day after two days of struggle in severe condition, majority of the surviving 40-player field still failed to turn in low scores although Lascuña continued his fight back from a woeful opening 84 with a second 69, a bogey-free round. But the reigning Order of Merit champion, who lost by three to absentee Miguel Tabuena here last year, remained 17 shots behind Que for joint third with Rufino Bayron and Joenard Rates, who turned in identical 71s, and Albin Engino, who fumbled with a 75. Paul Echavez shot a 71 to tie Frankie Miñoza, who hobbled with a 73, and American Nicolas Paez, who limped with a 76, at 223 while Zanieboy Gialon fired a 71 to move to joint 10th at 224 with Orlan Sumcad (73), Japanese Shotaro Onuki (74) and Omar Dungca (76) in the event backed by KZG, Pacsports, Custom Clubmakers, TaylorMade, Sharp, Champion, Summit Mineral Water, Event Captain, Ping and Pioneer Insurance.